Sen. Kamala Harris has made it official: she’s running for the Democratic nomination for president. Her announcement, intentionally chosen for Martin Luther King Jr.’s day, is hardly a surprise. She’s been building a campaign infrastructure for months now. She’s joining a race that already includes fellow senator Elizabeth Warren and that will likely ultimately total 20+ candidates when all is said and done. Many of the candidates will be tripping over themselves to woo the LGBTQ vote. But Harris has an advantage, having pushed for substantive advances throughout her career. Here’s a guide to Harris and her campaign. Harris is a native California, born to immigrant parents (her father is from Jamaica and her mother from India). She got her law degree from the University of California, Hastings School of Law. Once she was admitted to the bar in 1990, she started a lengthy career as a prosecutor, first as an assistant prosecutor in the Bay Area, then as San Francisco’s District Attorney and finally as the California State Attorney General. She was elected to the U.S. Senate in 2016. Harris is playing off her past as a prosecutor with a tagline, “Kamala Harris. For the people.” She seems ready to position herself not just as the anti-Trump but as someone with a vision for a progressive future for the Democratic party. 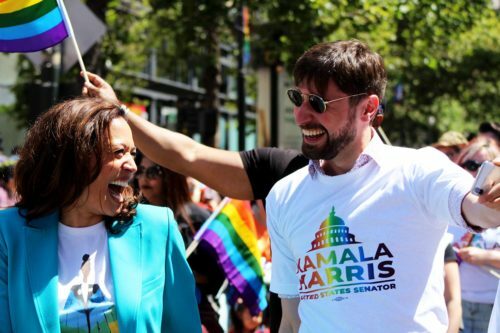 As you’d expect with someone steeped in San Francisco politics, Harris has been a long-time proponent of LGBTQ rights. As San Francisco’s district attorney, she created a special hate crimes unit focused on crimes against LGBTQ children and teens. She pushed for legislation to ban a gay/transgender “panic” defense and to ban conversion therapy for minors. She vigorously opposed Proposition 8, the state’s anti-marriage measure, and provided legal arguments against it cited by the Supreme Court when it was overturned. When Proposition 8 was finally struck down, Harris presided over the wedding of the couple who brought the suit against the initiative. As a Senator, Harris made Brett Kavanaugh squirm during his confirmation hearings by questioning him intently on marriage equality. In short, Harris hasn’t just supported LGBTQ issues; she’s advanced them. No wonder Harris is well positioned to capture the LGBTQ vote. Harris distinguished herself as a voice of the Trump resistance with her aggressive questioning of Jeff Sessions and Brett Kavanaugh in their appearances before the Senate Judiciary Committee. As an African-American woman, who stands in sharp contrast to the racial resentment of the GOP base, she can bolster turnout for Democrats after Hillary Clinton’s comparatively weak showing among black voters. At 54, Harris represents a new generation of Democrats compared to the Elizabeth Warren-Bernie Sanders-Joe Biden cluster. Harris is also extremely well-organized. She has a strong campaign organization already in place, making her a serious contender right out of the gate. Harris has only been a senator for two years (although so was candidate Obama). She’s largely unknown in what promisees to be a crowded field. As a prosecutor for twenty years, she offers opposition researchers a lot of material to mine. Harris is already coming under criticism from progressives who say she failed to embrace criminal justice reform and refused to reconsider convictions in the face of tainted evidence. Although the Democratic field is going to be crowded, Harris stands out. She enters the race with a better chance of winding up the nominee than most of her competitors.